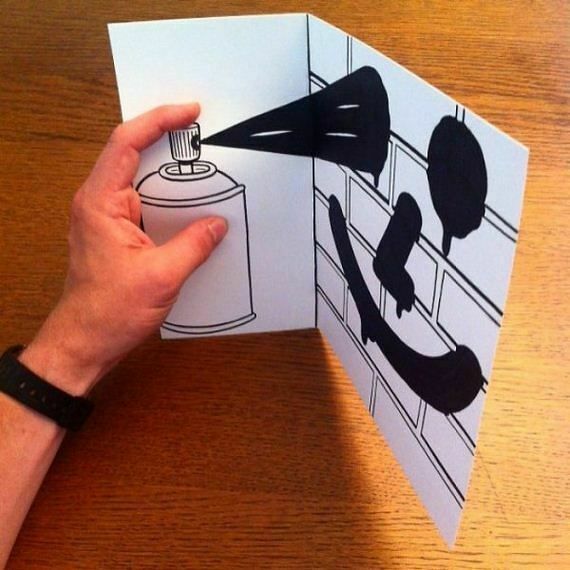 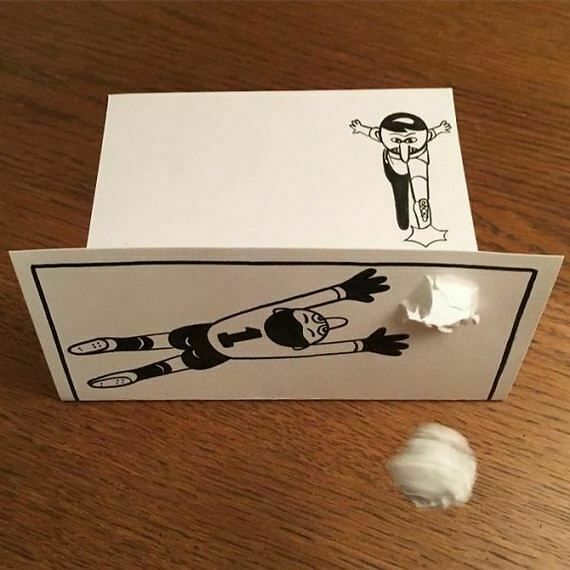 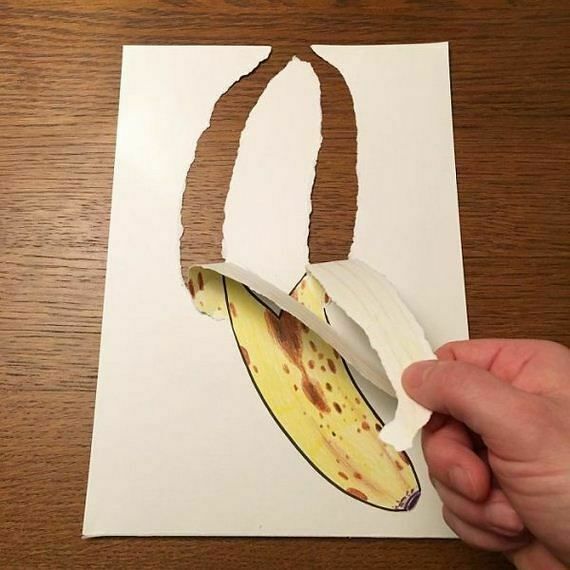 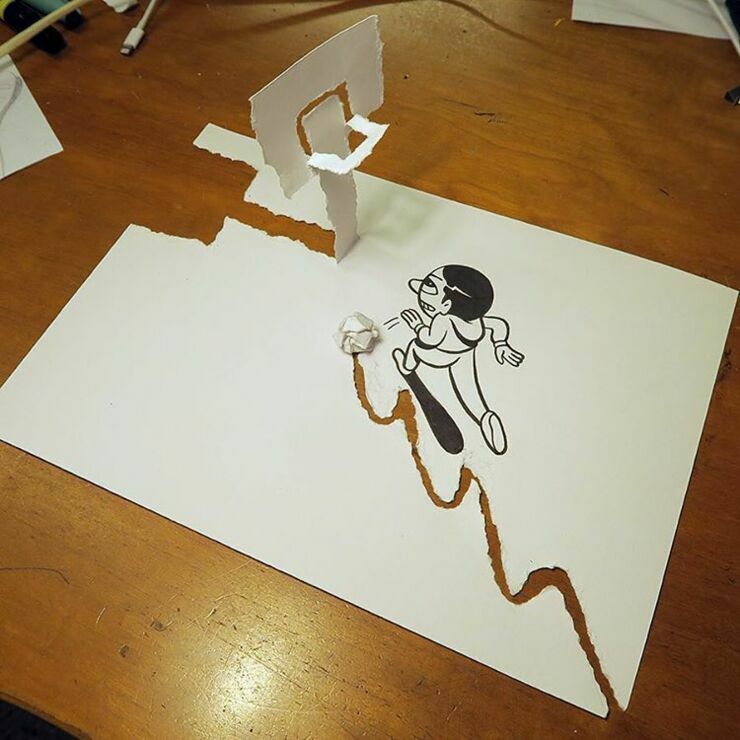 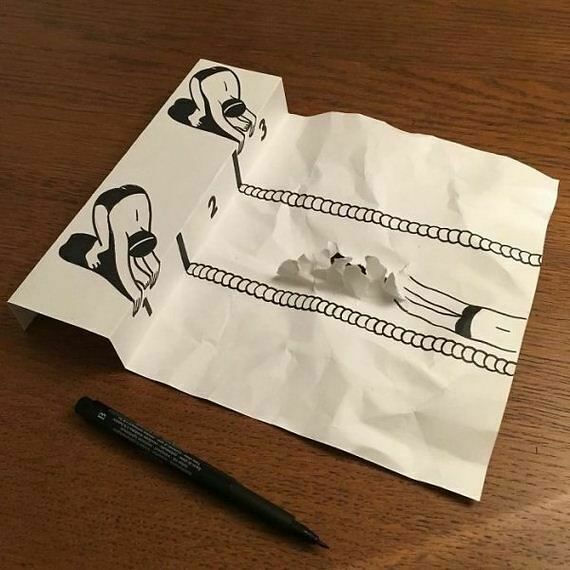 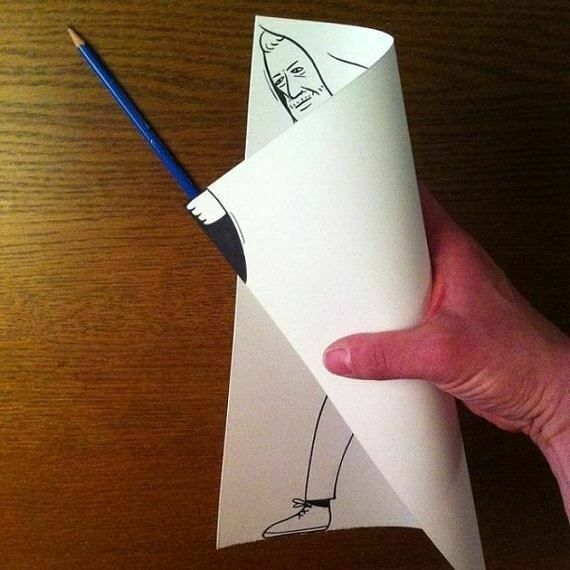 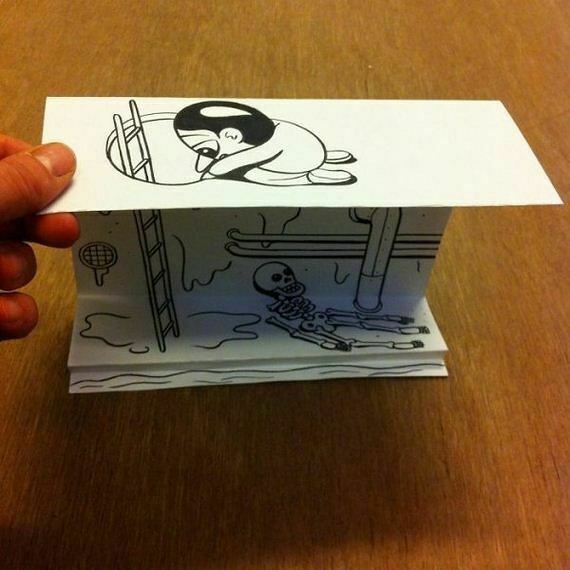 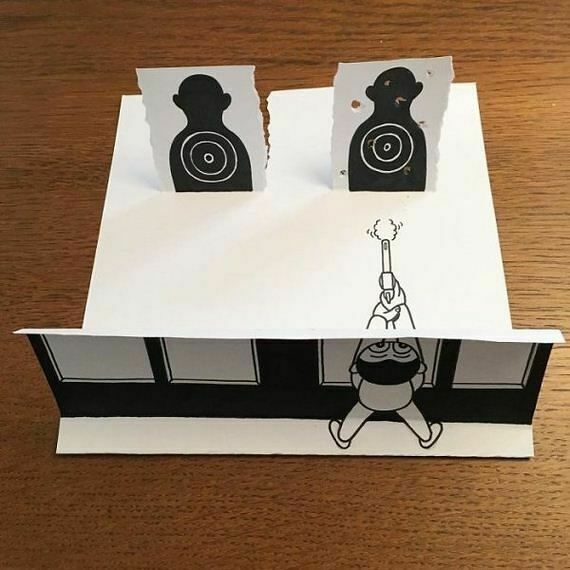 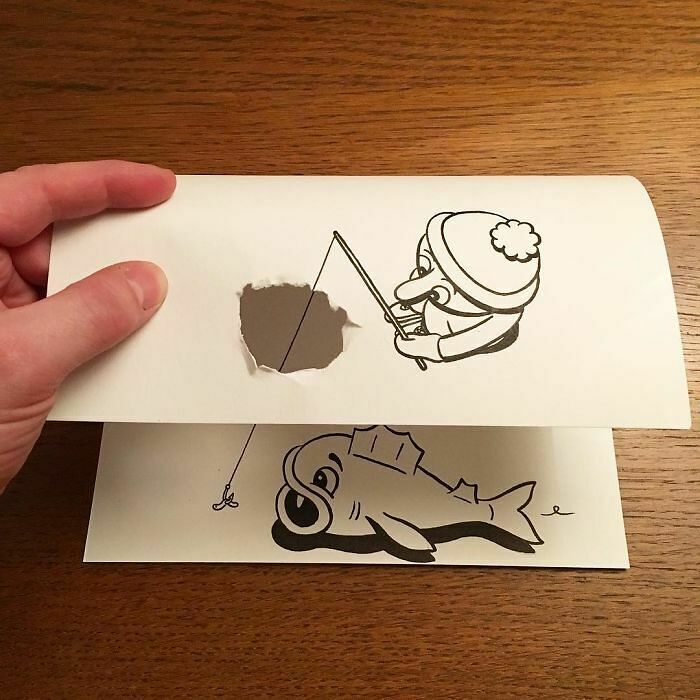 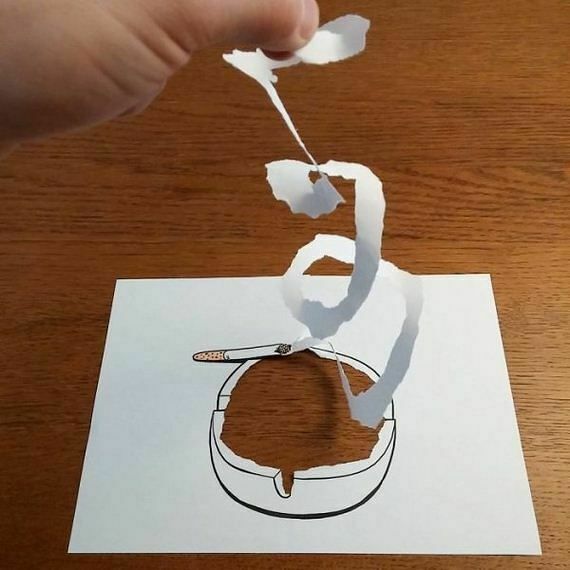 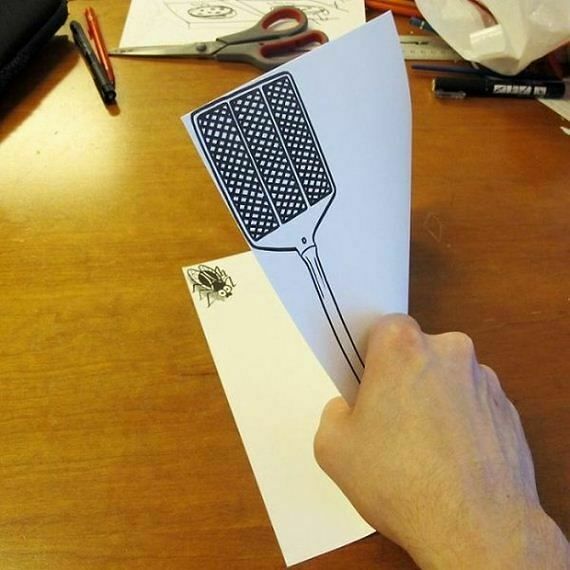 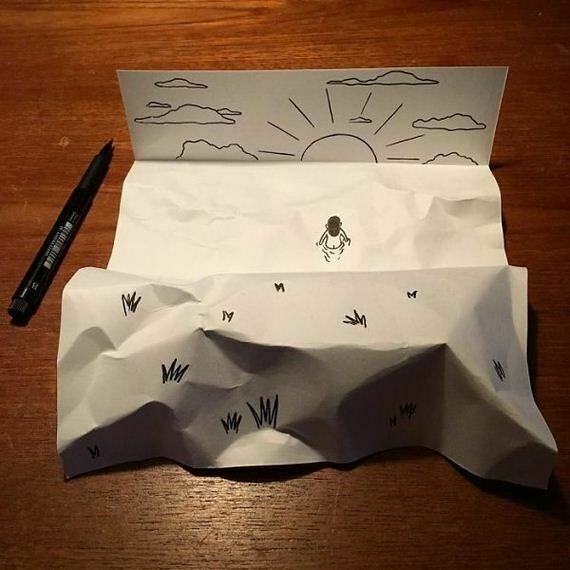 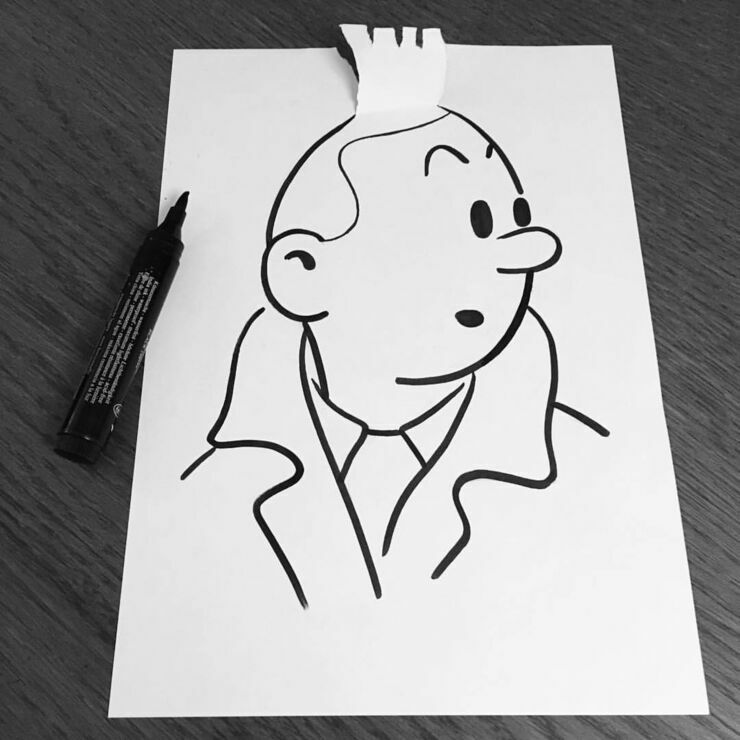 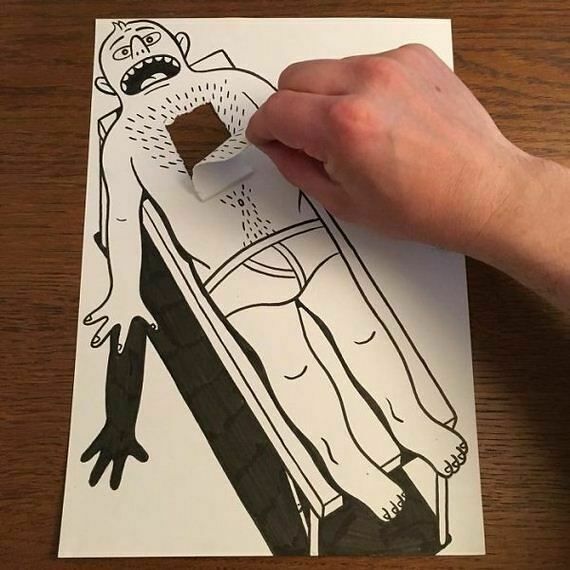 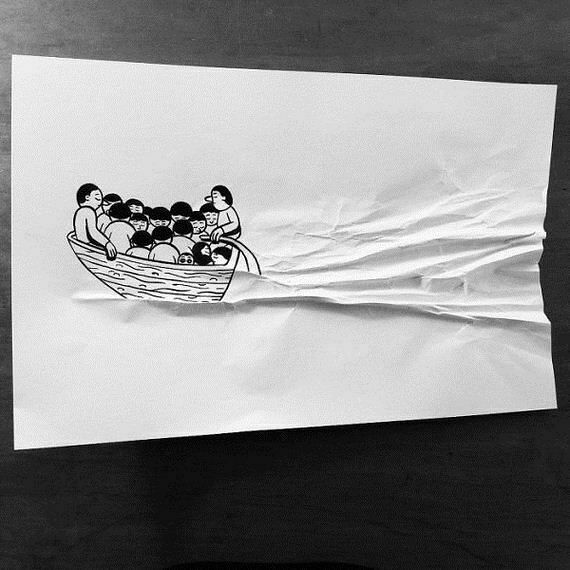 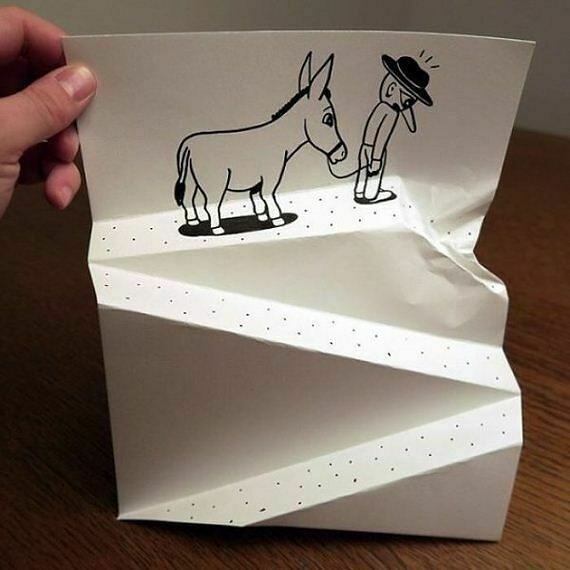 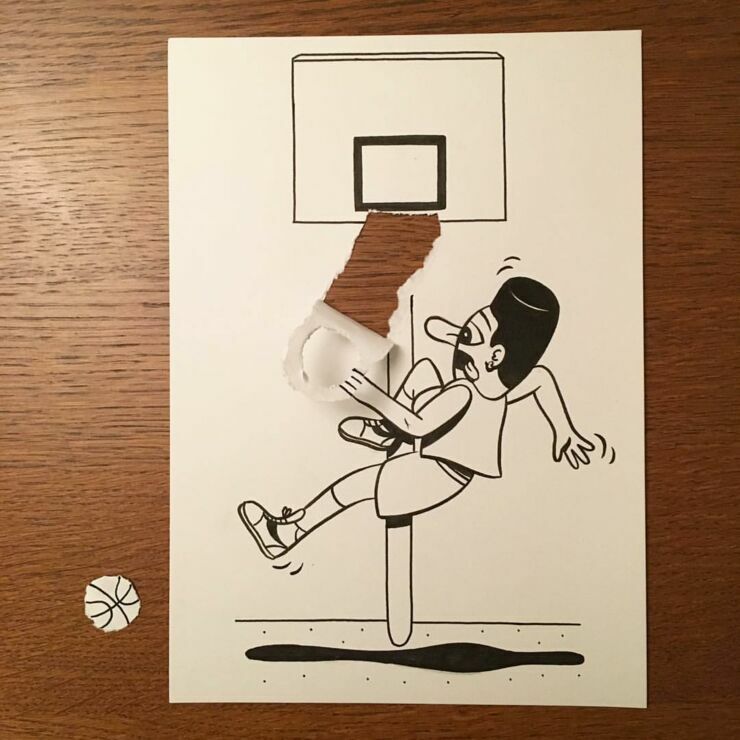 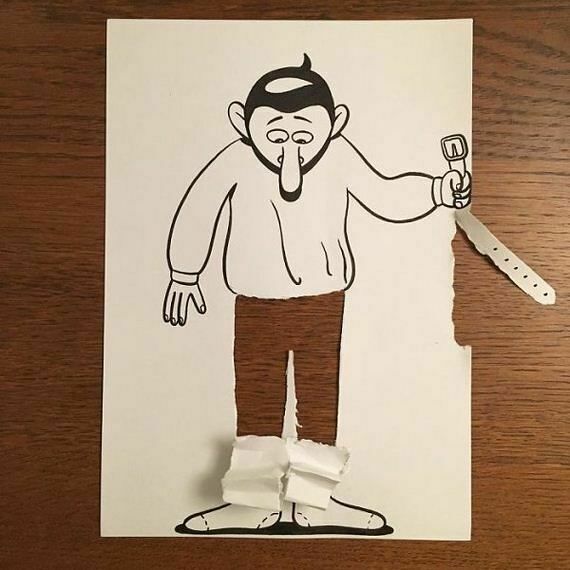 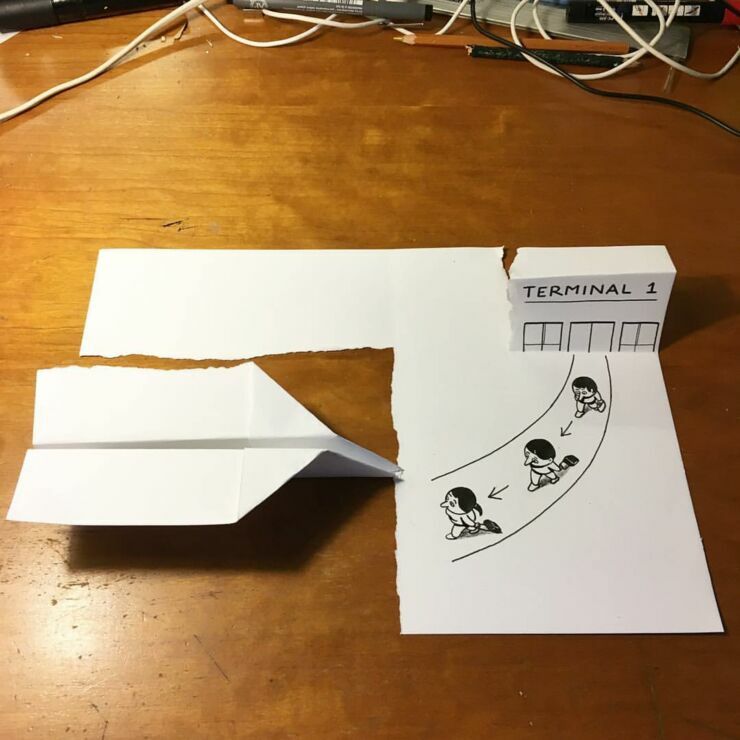 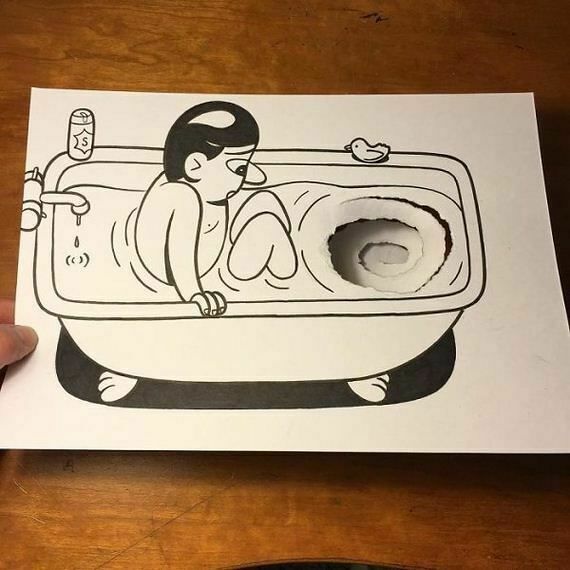 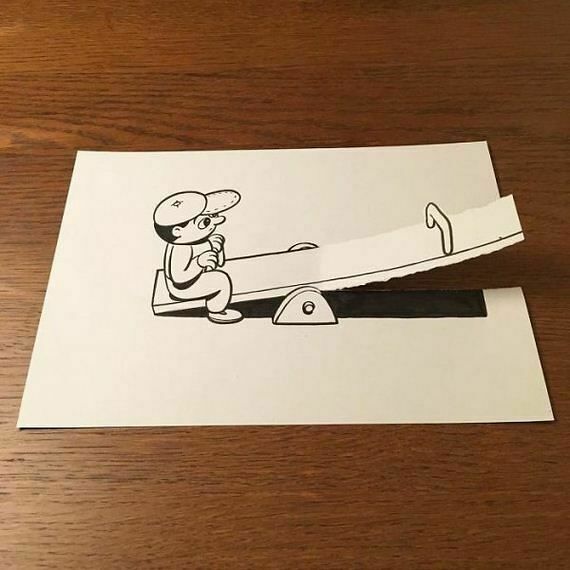 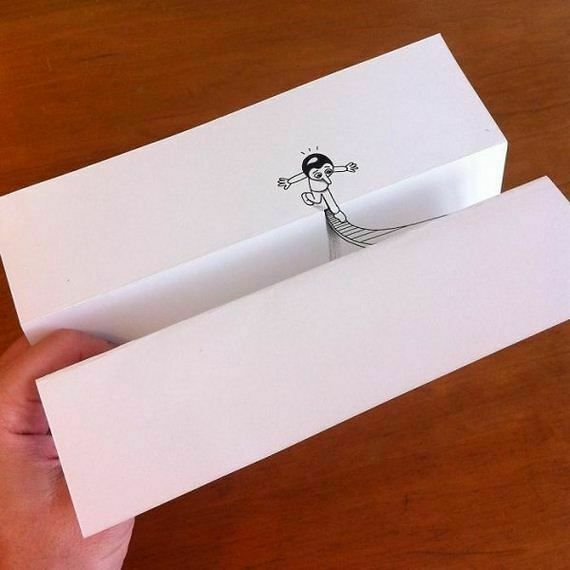 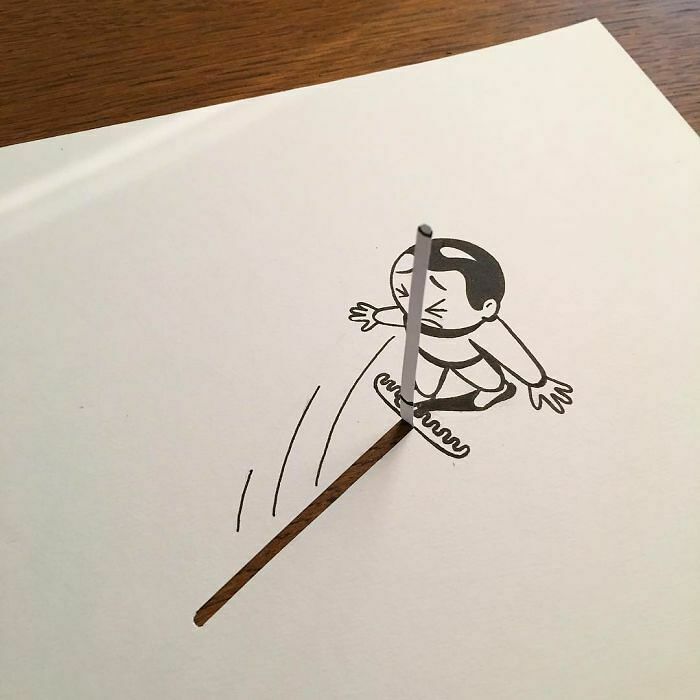 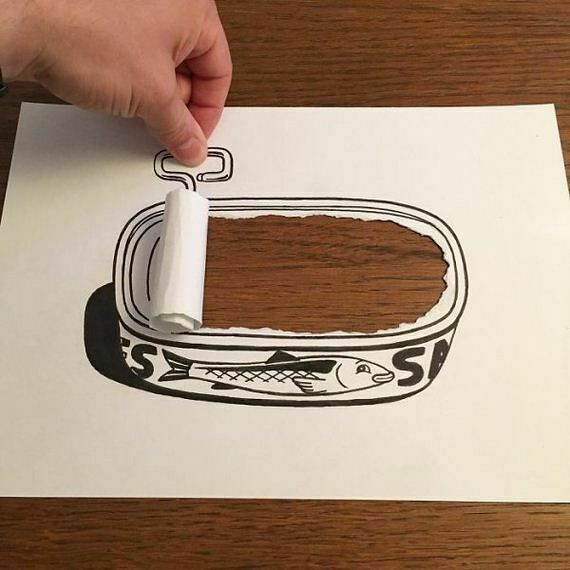 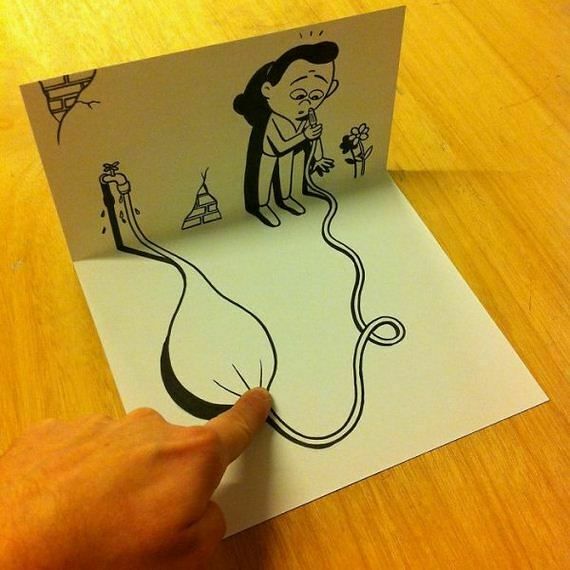 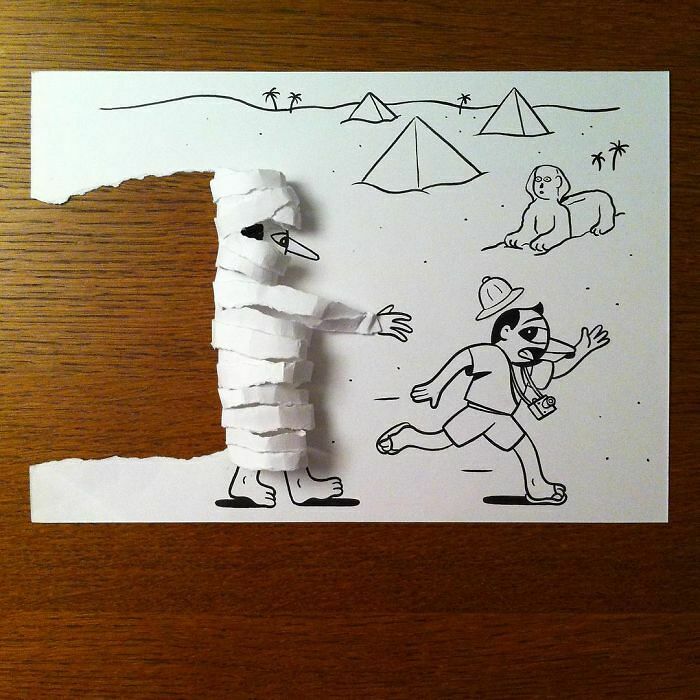 Not only do the drawings of Danish illustrator HuskMitNavn (which translated means "RememberMyName") have a great, comical style to them, but the artist also using cunning yet simple 3D trickery to add extra dimensions of fun to the white pieces of paper he draws them on. 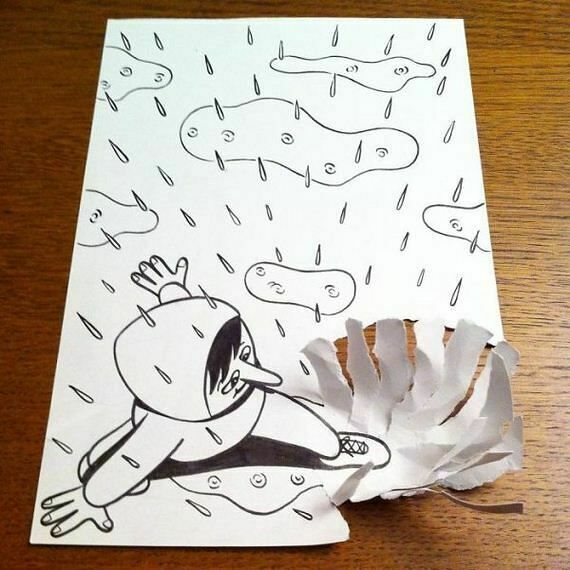 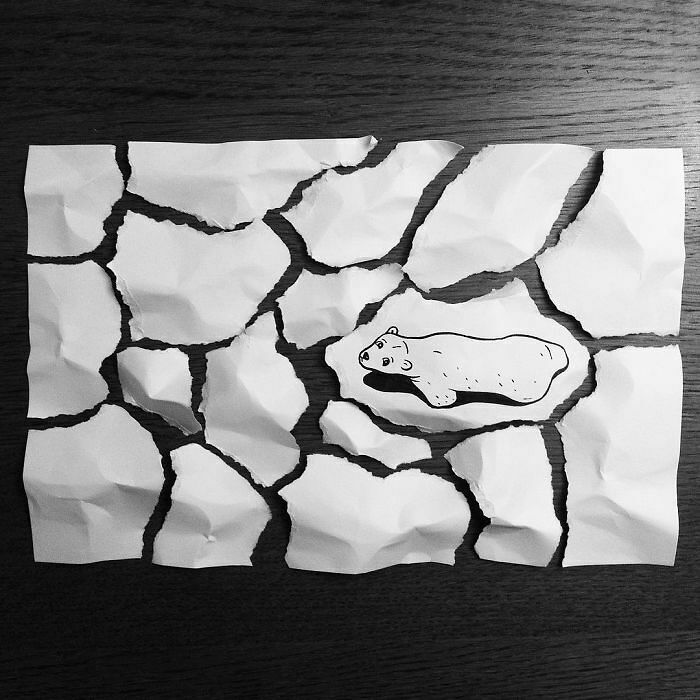 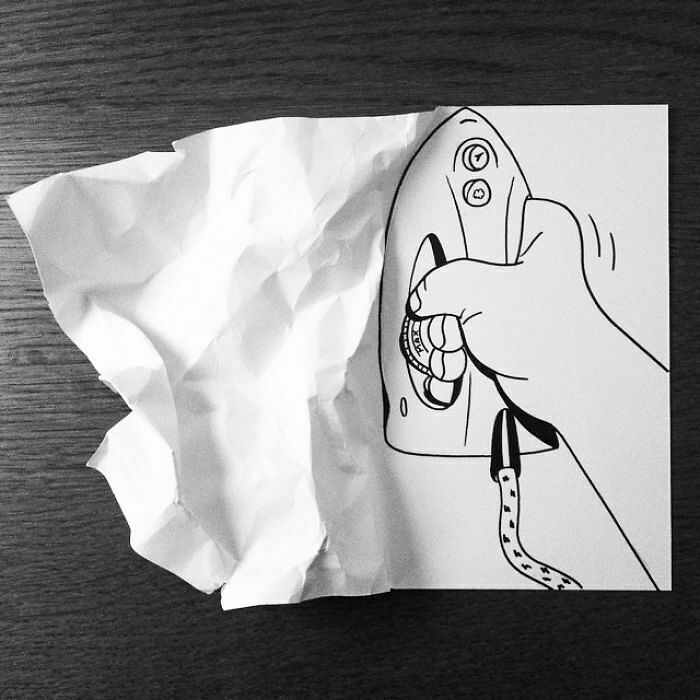 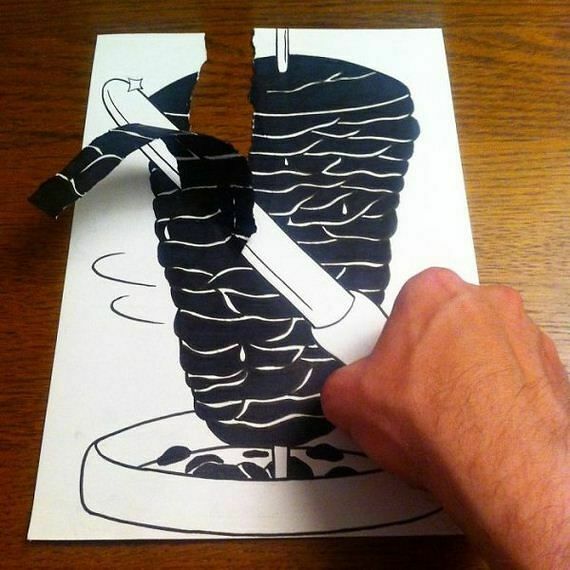 Just by folding some paper, cutting or tearing out parts of it, HuskMitNavn makes his illustrations leap out from the page, often in a slapstick and amusing manner. 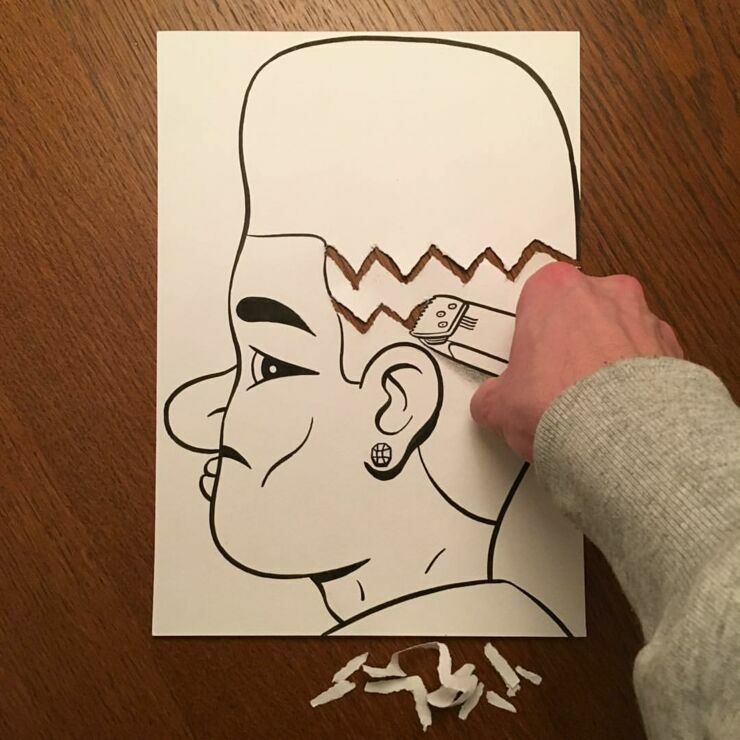 HuskMitNavn lives in Copenhagen, Denmark and says he draws most of his inspiration from routine life. 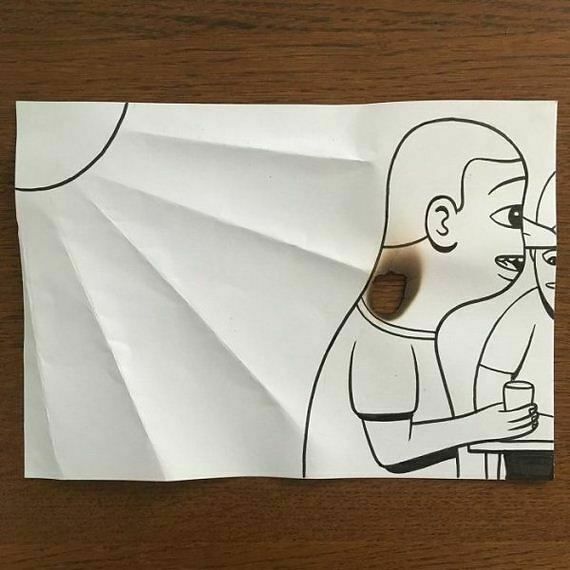 Which is why a lot of his work nods to people's everyday, ordinary lives, but elevates it to surreal or extraordinary comic situations. 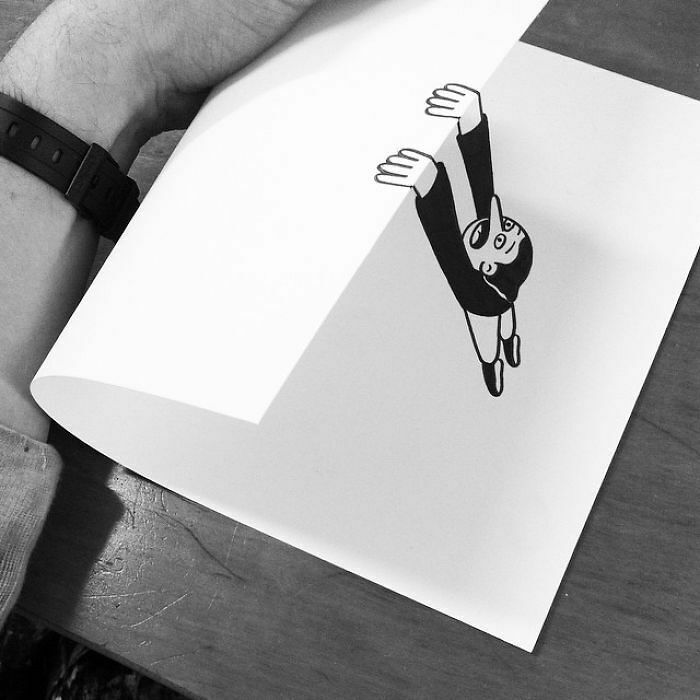 "My simple everyday life is my main source of inspiration." 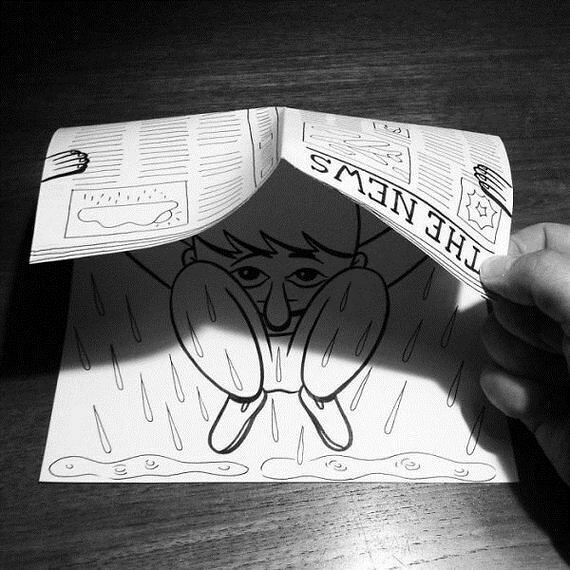 he explains in an interview with The Hundreds. 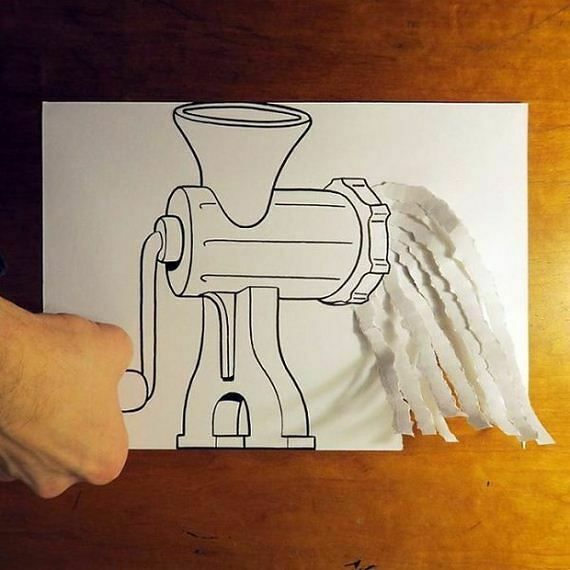 "I try to squeeze as many ideas out of it as possible. 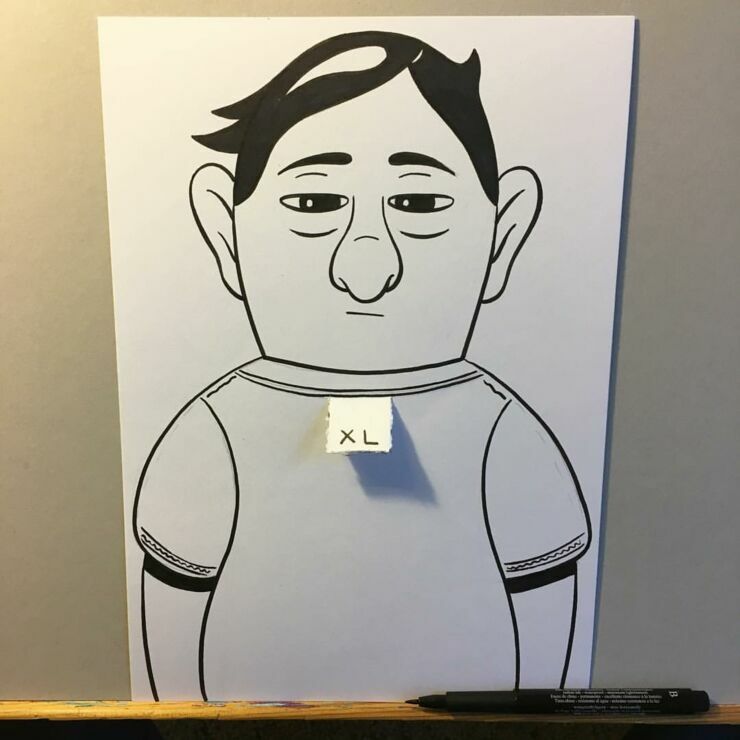 I try my best not to look too much at what other people are doing, but Walt Disney, old Asterix comics, Keith Haring, Charles Burns and Edvard Munch are some of my many sources of inspiration." 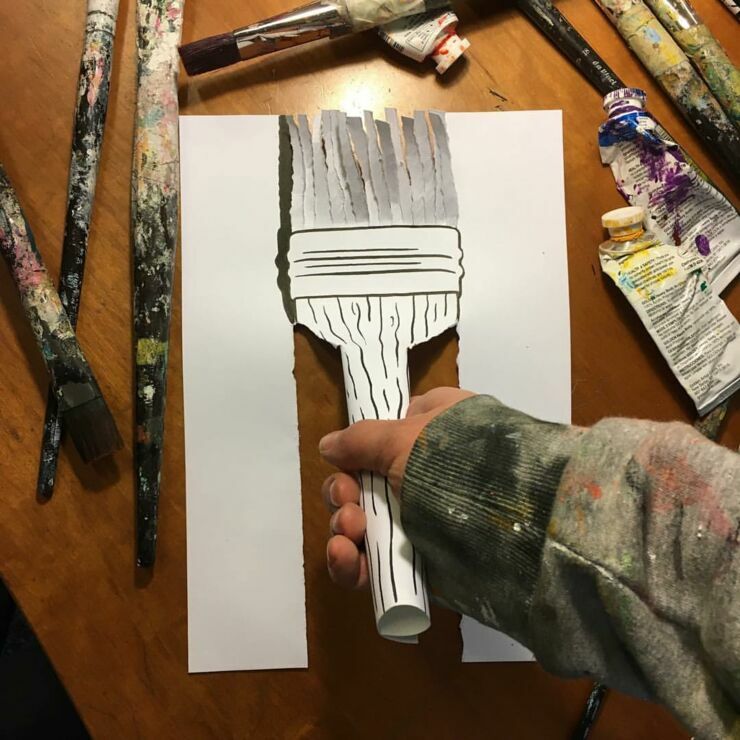 His work isn't just clever 3D drawings either, but he also does public artworks in the form of graffiti—which is where he first began developing and showing his art and characters—magazine prints, and paintings. 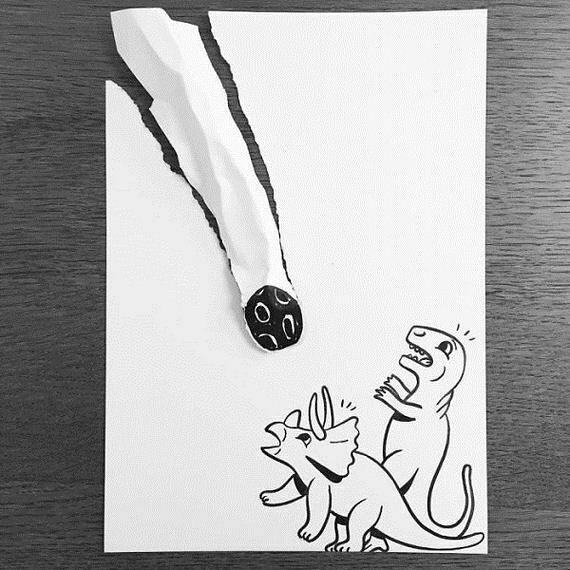 "I want to make some art that people can relate to." 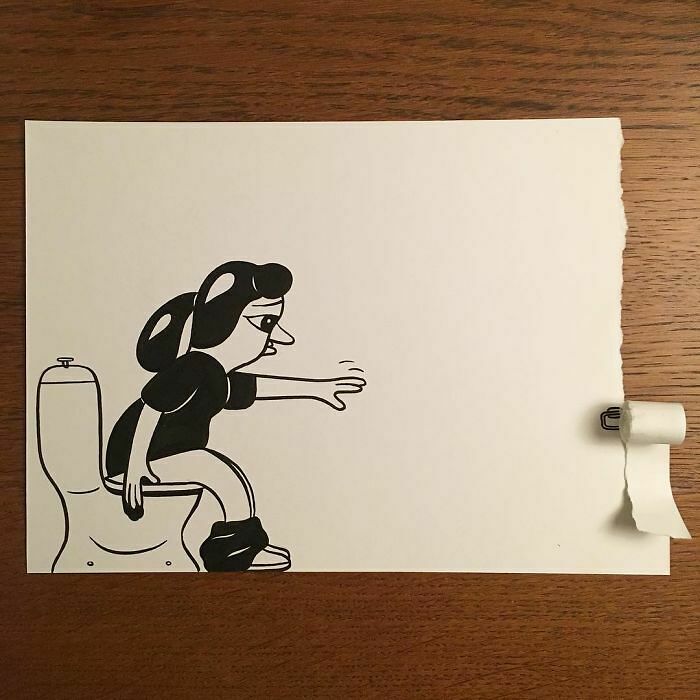 HuskMitNavn says. 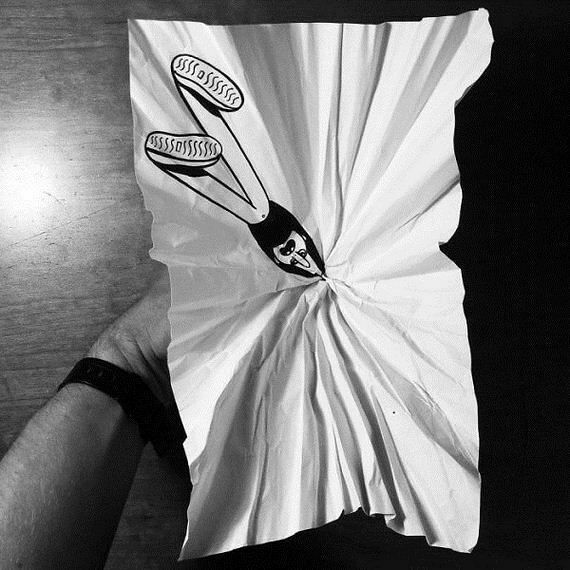 "There is so much dark and pompous art in the world; I’m trying to make the opposite thing." 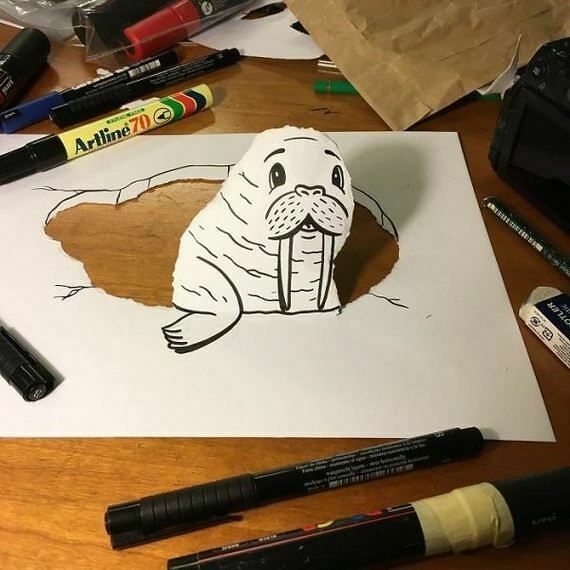 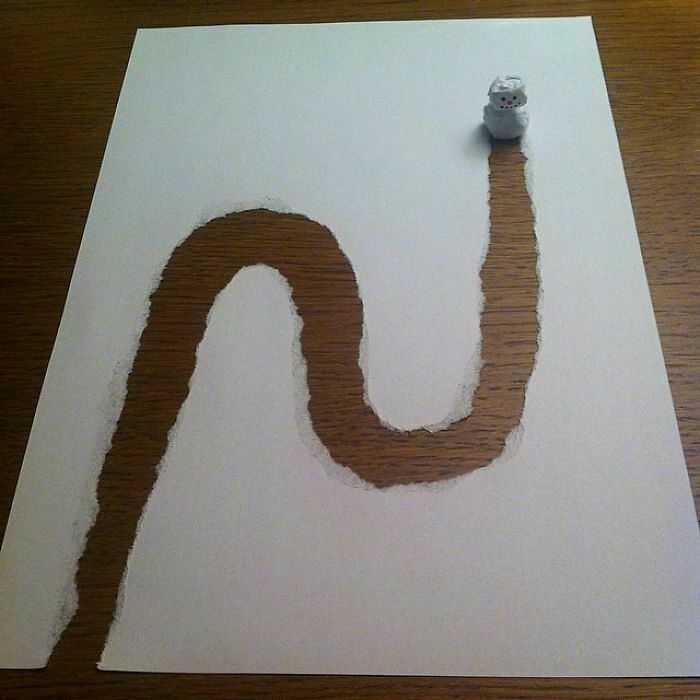 Check out some of his 3D drawings below. 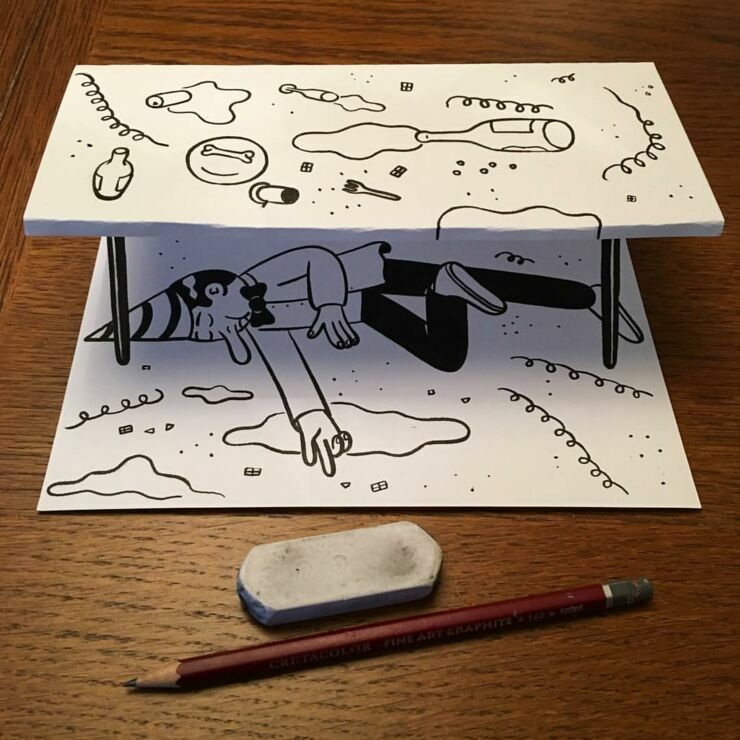 And head to his website, Instagram, and Tumblr, for more of his work.